IndyVet Emergency & Specialty Hospital has presented its Professional Excellence Through Service Award, also known as the P.E.T.S. 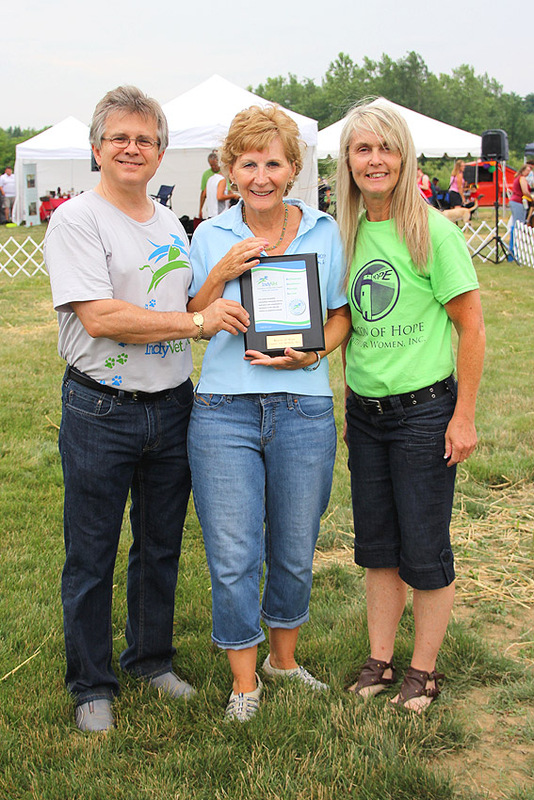 Award, to Beacon of Hope Center for Women for its Foster Pet Program. During IndyVets annual Pet Carnival in July, the veterinary practice honors individuals or organizations that demonstrate outstanding community service, dedication, love and commitment to animals. In 2012, Beacon of Hope launched its Foster Pet Program to provide a safe alternative for abused women and their four-legged companions by utilizing volunteer host families to house pets until the owner returns to a safe environment. Since its inception, the program has placed 46 animals in foster homes. According to the American Humane Society, 68 percent of abused women have reported that an abuser is violent towards their pet. And 40 percent of abused women are too scared to escape abusive situations because they worry about what will happen to their pet. Beacon of Hope is the only domestic violence organization in Marion County that offers assistance to victims pets. In addition to giving the animals a temporary home, the program also provides vaccines and food. The program is currently seeking foster homes for dogs, cats and birds. Past P.E.T.S. Award recipients include the Indianapolis Fire Department and Harshman Magnet Middle Schools Animal C.A.R.E. Club. Pictured from left to right: Dr. James Speiser, IndyVet owner; Terry Moore, Beacon of Hope executive director; and Tammi Culmann, volunteer foster pet coordinator. IndyVet Emergency & Specialty Hospital is a 24-hour Central Indiana veterinary practice where care comes first. The facility provides services that include: emergency and critical care, surgery, internal medicine, ophthalmology, CT scans, radioactive iodine 131 therapy, a canine & feline blood bank and donor program, and rehabilitation. All pets are seen for emergency or referred problems only. For more information, log on www.IndyVet.com. For pet emergencies, call 317-PET-E-911.